Continuing this thread on Jamestown, at the end of class I offered an example of brainstorming research topics. The example I used built from our reading of John Smith’s General History of Virginia and the slightly improvised session on the characters of Jamestown. Men skilful in burning of Sope ashes, and in making of Pitch, and Tarre, and Rozen, to be fetched out of Prussia and Poland, which are thence to be had for small wages, being there in maner of slaves. Although it is still unclear where or how these men were found, research shows that John Smith had met at least of couple of these men in Poland in 1603. 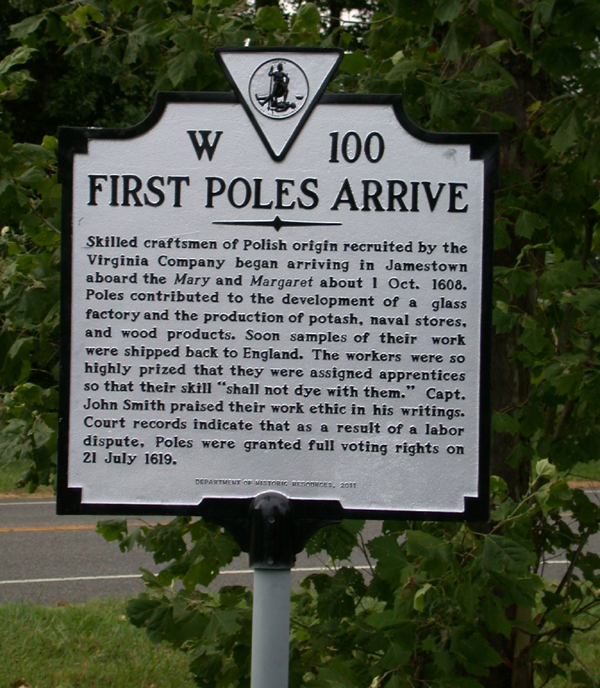 The first Polish group arrived at Jamestown in October 1608 aboard the Mary and Margaret under the command of Captain Christopher Newport. The Poles were listed on the manifest are Michał Łowicki, Zbigniew Stefański, Jan Mata, Jan Bogdan, and Stanisław Sadowski. They were a group of artisans who offered a much-needed set of practical skills to the colony. Łowicki was a London resident and businessman. Listed as a “noblemen,” he was presumably the leader of the group. Stefański was from Włocławek and worked in glass production. Mata of Krakow was a prominent soap producer, and Sadowski (from Radom) and Bogdan (from Kolomyja) worked with lumber, pitch and tar, and shipbuilding. Captain Smith confirms that these laborers were to make pitch and tar, and soap-ashes, and to set up a glass-mill, or glass-house, for the manufacture of glass. According to his reports, within three weeks the group made a clearing, tapped trees and set up a working furnace. He gives this handful of men credit for saving the colony in its first years. Reliable research, however, is limited. 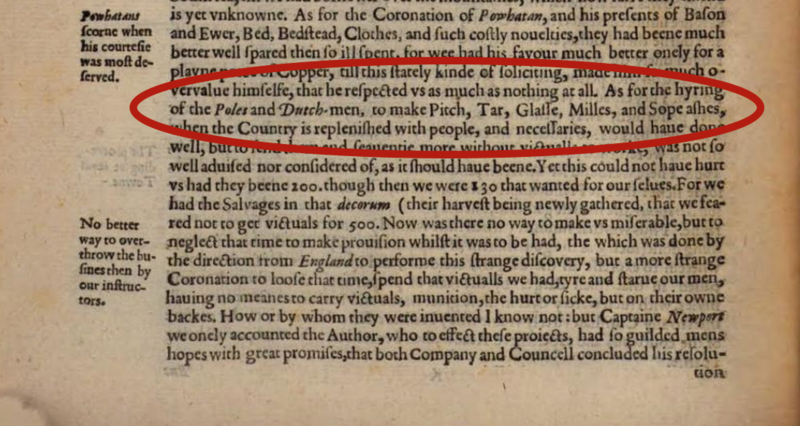 Upon some dispute of the Polonians resident in Virginia, it was now agreed (notwthstanding any former order to the contrary) that they shalbe enfranchized, and made as free as any inhabitant there whatsoever: And because their skill in making pitch & tarr and sope ashees shall not dye wth them, it is agreed that some young men, shalbe put unto them to learne their skill & knowledge therein for the benefitt of the Country hereafter. In short, the Polish residents were denied specific rights and protested, until freedoms were granted. This seems to have been a short protest: the Polish were granted the same rights as the English and they returned to work and trained apprentices in their respective crafts. Building on this work, Arthur Waldo continued this line of inquiry in a series of articles in the 1960s. Although arguably a bit hyperbolic, he considers that the Polish 1619 strike “introduced for the first time the spirit of democracy, equality, and brotherhood on this continent, predestined to give humanity liberty and justice.” Assuming that the Poles were Roman Catholic, he also contends that their presence and beliefs launched religious toleration in America, although no evidence exists regarding religious freedoms as a major issue during these years in the colony. Sadly, Stefański’s work remains missing, so much of the narrative regarding the work conducted by Poles in Jamestown must remain in question. 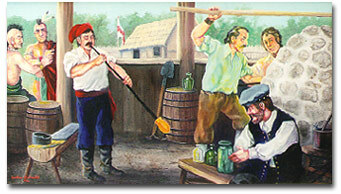 Nevertheless, it is clear that these first Polish immigrants had a major impact on the work and survivial of the Jamestown. Original sources confirm that the Poles were skilled artisans whose work John Smith recognized. And Smith also confirms that the Poles helped defend the fort against the local Indians. 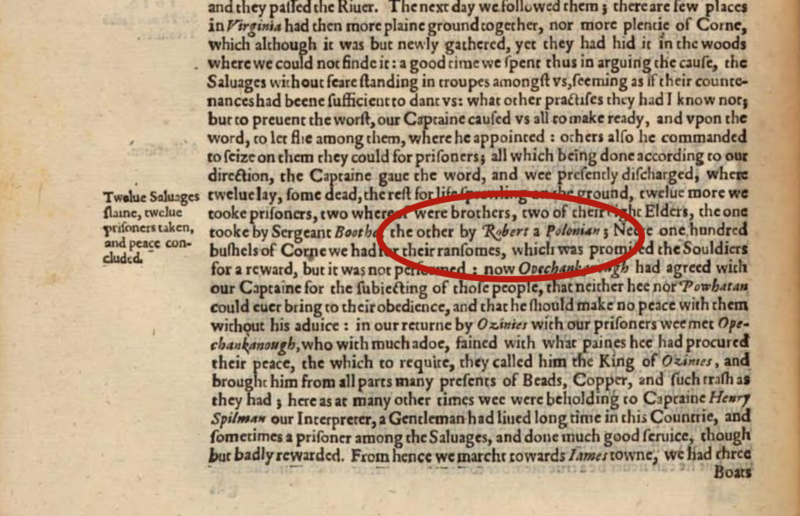 In one account, Smith describes the capture of two Indian “elders” apprehended by “Robert, a Polonian.” In another story, “Mathew, a Polander” is identified as one of the victims of an Indian attack. Note that neither one of these individuals are listed among the first list of arrivals. The presence and activity of Poles in the early Jamestown colony is limited but clear. As I tell my students, it is important to be skeptical and to search for the facts. It is important to continue to search out for more research, more accounts and stories and perspectives. And it is important to expect the unexpected: you never know what you’ll uncover until you do the search. Maybe more archaeological findings are to come, shedding new light on the first Poles in America. Maybe not. But, in the meantime: Remember the Poles! Cera, James B. “Some Doubtful or Disputable Interpretations.” Polish American Studies, vol. 15, no. 1/2, 1958, pp. 40–41. Chandler, Alvin Duke, “The Poles at Jamestown.” The Polish Review, vol. 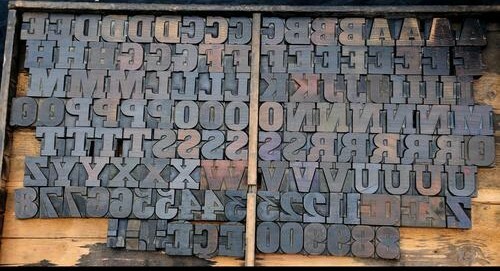 2, no 4, 1957, pp. 3-6. Haiman, Mieczyslaw. “Polacy wsrod pionierow Ameryki” [“Poles Among the Pioneers in America”], in Z Przeszlosci polskiej w Ameryce. Druk “Telegramu,” 1927. Pula, James S. “Fact vs. Fiction: What do we really know about the Polish Presence in Early Jamestown?” The Polish Review, vol. 53, no. 4, 2008, pp. 477-493. Uminski, Sigmund H. The Polish Pioneers in Virginia. The Polish Publication Society of America, 1974. Wachtl, Karol. Polonja w Ameryce [American Polonia]. Gwiazde, 1944. Waldo, Arthur L. First Poles in America 1608-1958. In Commemoration of Their Landing at Jamestown October 1, 1608. Polish Falcons of America, 1957. Waldo, Arthur L. True Heroes of Jamestown. American Institute of Polish Culture, 1977. 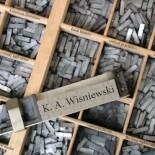 This entry was posted on March 26, 2019 by k.a.wisniewski in Design, History, Literature, Local History, Teaching, U. S. History, Work Report / Progress and tagged American History, crafts, glass-making, Jamestown, labor history, Poland, polish-americans, protest, research, Virginia.